Hiring a web design can be an exciting process. When I talk about hiring a web design in this post, the advice can be applied in a variety of ways. First, it could mean hiring a single, usually freelance, designer for a job you need to be done. It could also refer to a web design agency. Additionally, it could be advice for hiring a web designer for your own team. The advice is valuable for web designers who are looking to improve their portfolio. Now, let’s discuss five different but important things when trying to hire a web designer. It’s still surprising how many times responsive designs don’t make it into a web designer portfolio. It’s hard to say if a designer is capable of delivering responsive design if it’s not there. It could be omitted by mistake or because they have never done it. You can’t tell if it’s not there. Now, this guide refers to a web designer. The web is a flexible medium that works on the tiniest devices and their tiny screens to larger devices and their larger screens. It’s important for any website to have a good responsive design. 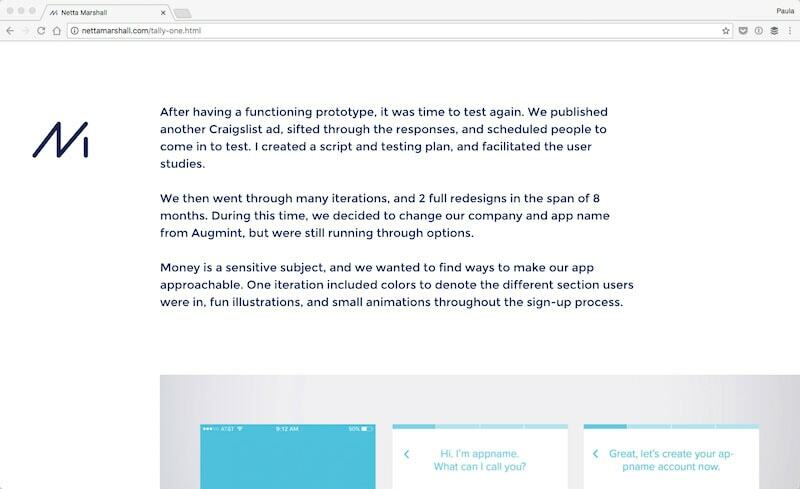 At this point in time, there is no excuse in not at least including a screenshot of the responsive design as part of a project’s case study. Jenny Johannesson shows off the responsive design in her portfolio. Her case study on Internet.org starts off with working on the project with a mobile first approach. That’s huge! It’s actually quite impressive too. In her case study, mobile devices aren’t even an afterthought. They are a central part of her project and how she approached it. Additional, the portfolio of Toy Fight includes a case study for Outpost. 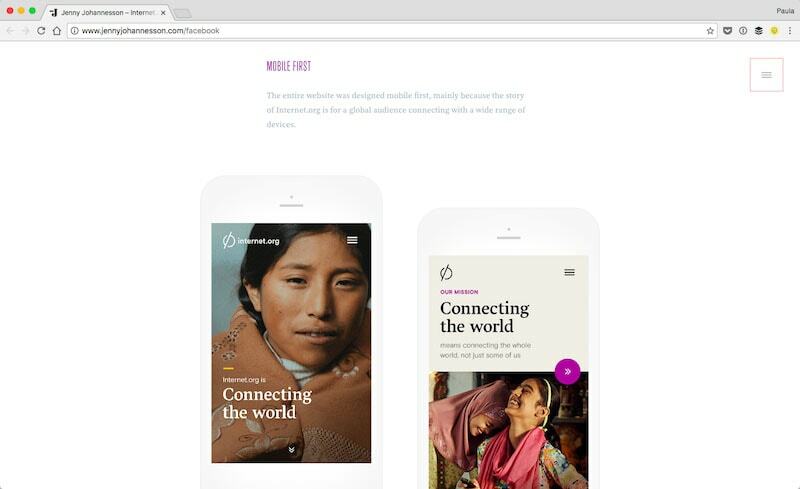 As part of the case study, the agency includes a section for mobile design. 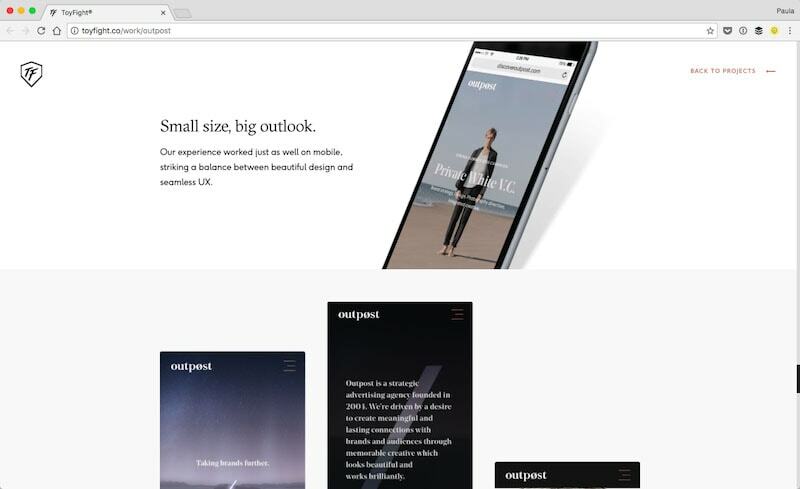 They explain that the approach towards mobile design was well fitting for mobile just as it was for the desktop design of Outpost’s website. Every web design project should start with some sort of research. Research allows you to start the project in the right direction, on the right foot. There are so many different ways to go about research. There is no single method of getting insight. Research can include things such as user interviews, AB testing, analytics and metrics, heat maps, heuristic evaluations, personas and scenarios, surveys, or usability studies, among many other. Netta Marshall includes a quick blurb on how research impacts a project she worked on for Tally. She explains how the research was conducted – through Craigslist volunteers – and how many iterations her testing produced – 2 full redesigns. Although she doesn’t go into too much detail here, it’s clear that Netta doesn’t design something willy nilly. There is a process that she follows and it impacts the product she is trying to build. More or less, design is about communication. A lot of what designers do is communicating with their clients or bosses and then again with the target audience of the website. It’s important to show good communication skills within a web designer’s portfolio. A web designer’s job is never only just the final UI design. That’s the just the pretty end-product. A great web designer will walk their audience through their case studies. They will communicate their projects, their part in it and their process, among a whole lot of different information. I truly admire the portfolio of Hyun Seo. At first glance, there is a whole lot of text and not a lot of UI screenshots. That’s a good thing. 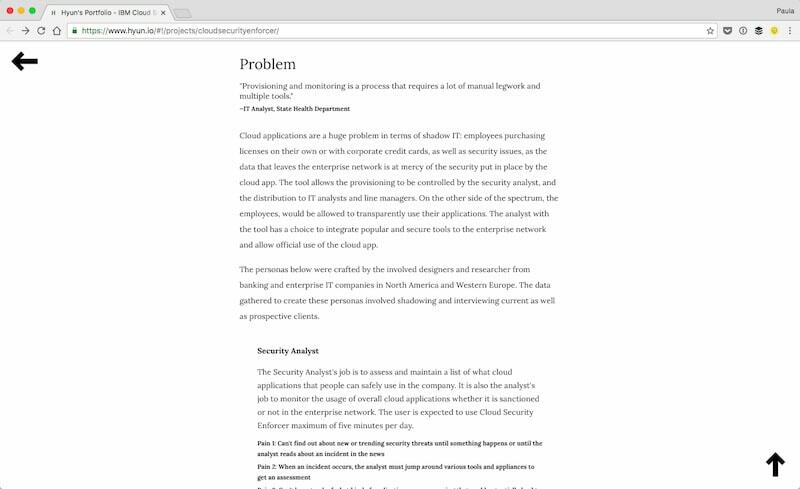 Hyun’s case study on IBM’s Cloud Security Enforcer start of with a lot of text. It’s him explaining the project to a potential client or company. The case study is about ¾ text and ¼ screenshots. The screenshots are all the way at the end, by the way. The case study communicates well his role in the project, the problem and how he tackled it. Is the web designer and artist or a problem solver? Yes, websites created with a talented web design will be beautiful. But that’s not why people or business need them. Websites are a way to solve business problems such as increasing sales, clicks, or sign ups. Different projects will have different problems and different measurements of success. Actually, a web designer who is a good communication will make this distinction easy for you to see. They will clearly communicate their problem-solving skills. The case study on the redesign of the Met from Fantasy explains a few different problems their redesign tackled. 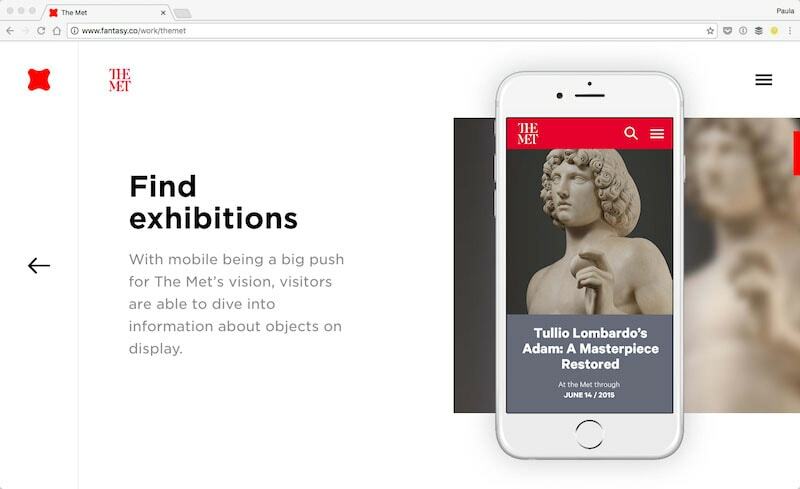 The design focused on helping users find exhibitions, plan a visit and even support the Met through donations. Unfortunately, their case study does not go into too many details of each problem. But, it is still a clear indication that the agency takes business objectives seriously. 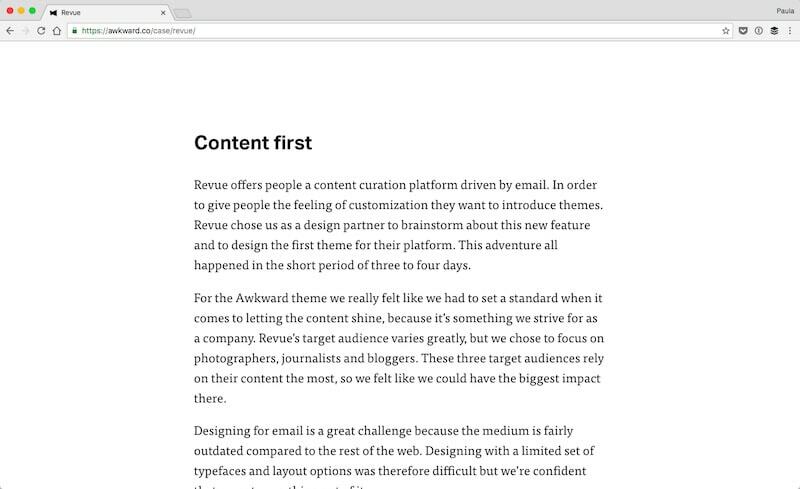 Another example of a good and quick case study for Revue by Awkward. The case study is quick and the point. The case study explains the thinking process of how Awkward arrived at a solution. Like I said, the case study is quick and to the point but it clearly shows Awkward’s problem-solving skills. I found that the best portfolios have case studies that show off the design process for each individual project. Most often it highlights that made the project awesome, interesting, or even difficult. It’s so much better than a separate process explanation because it’s relatable when it’s tied to a specific project. As a potential client or boss, you’ll get a clear idea of how the designer or agency works and thinks. Additionally, showing off the process will let everything else in this post fit right in. Sharing the process will also share a web designer’s communication skills. It will clearly indicate the designer is a problem solver because they are showing you how they solved the problems at hand. Having a few different projects will allow you to share different skills. Some case studies can have a quick snippet about the done research, or about how responsive design was important to that project. One of the most beloved examples of a company sharing their process has to be Focus Lab. They are a known and admired web agency which built their name by sharing their work in progress and their design process. 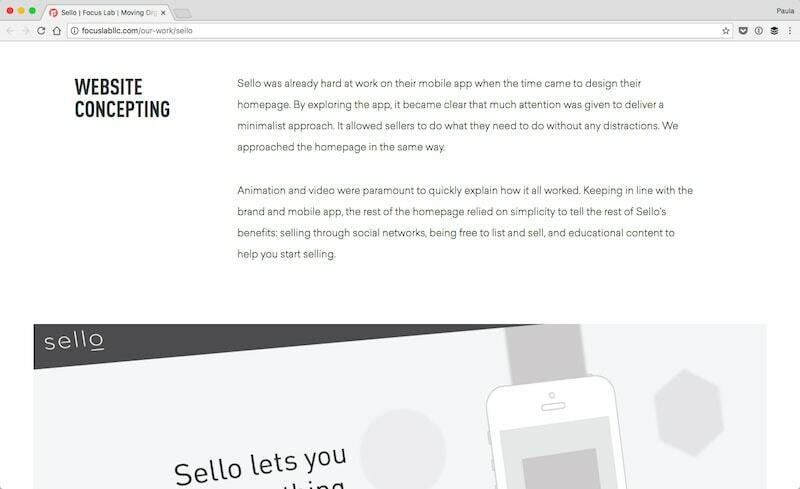 Take their case study on Sello. It’s divided into different sections starting with a quick explanation of the challenge. The next section shows how the agency worked through different logo design concepts. Next, they show off how they created wireframes for the website. So on and so forth. There is a lot of images sharing the story of how they went about the design process. Hopefully, this post gave you a good idea on what to look for when looking to hire your next web designer. Like I said in the beginning, this advice can be applied to a web design agency as well. And, it can help web designer structure their future portfolios. Over the last few years, I noticed a big trend and change in portfolios. These tips are meant to help you distinguish the best and greatest designers from the rest.